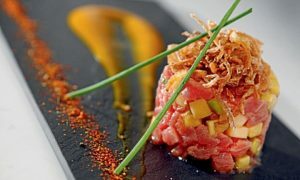 Toki: Toki is one of most expensive restaurants in Abu Dhabi. The environment in Toki is elegant and clean but has an expensive menu that includes a huge Japanese box and a wide variety of Sushi. 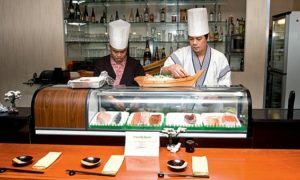 If you are Sushi fan then this is the right place for you. The Japanese dishes are excellent like the starters, such as edamame and grilled gyoza, and main course like katsu curries and a variety of donburi options. There are also a variety of Noodles but the dishes can be a little light on meat and vegetable ingredients. The staff are professional and knowledgeable at Toki. Taiki: Taiki is not amongst the expensive restaurants in Abu Dhabi. The atmosphere in Taiki is warm & intimate and the service is friendly and helpful. The menu includes soups, tofu dishes and bento boxes along with other Japanese dishes. Vegetarians will find a number of choices with a good selection of tofu dishes. Food is tasty and it is served in real quick time. The Yacht Club: The Yacht Club serves alcohol and there is a facility of indoor and outdoor seating. The places is small but it offers high quality food. The surroundings are stylish and elegant. The food presentation is delicate and food is even tastier. The music at the Yacht Club is contemporary and delightful. The menu includes the wagyu tayaki, made from spicy fish served with cilantro and a sweet chili dip, and the roasted duck quesadillas served with hoisin sauce and jalapeno guacamole. Sho Cho: Sho Cho is famous for serving the best of Japanese cuisine. It also has indoor and outdoor seating. Sho Cho has a buffet system so people could go and help themselves with their favourite food. The restaurant is stylish and it offers a view of the Maqtaa Creek. The Japanese dumplings and prawns in tempura batter are fantastic served as main course dishes. Aquarium: Aquarium as it is named is famous for serving a variety of seafood. It is designed as an aquarium and you might even get lost in it. Every Sunday Asian-style sushi and sashimi is offered in abundance. Aquarium offers various dishes like fried calamari and fresh octopus. 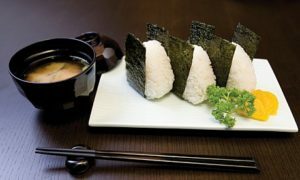 Summit Trading Company is a humongous supplier of fresh Japanese food ingredients like Sushi, Miso Pastes, Instant Miso Soups etc in Abu Dhabi,UAE. Summit also supplies more than 50,000 varieties of Japanese Tableware and Kitchen products like Portable Gas Stove with Gas Canister equipment of famous Japanese Brands like Tokiwa, Magokoro, Yasuragi, Gito and EBM. Summit is also known for Corporate Catering. Summit has a variety of Menu in Japanese Food. Japanese Cuisine is key dish of attraction.